USTA Florida has announced Christopher Champion as its newest head tennis professional, overseeing all public tennis sites in Gainesville. The not-for-profit in December finalized its contract with the City of Gainesville to deliver a wide range of programs for all ages and abilities. Champion is a USPTA Elite Professional and brings a strong background in community tennis to the new role, serving most recently as director of tennis for First Serve Miami. Champion will oversee four tennis sites in Gainesville: Albert Ray Massey (Westside) Park – Joyce Oransky Tennis Center (located at 1001 NW 34 Street), Tom Petty Park (formerly Northeast Park at 400 NE 16th Ave.), Northside Park (5751 NW 34th St.), and TB McPherson Park (1717 SE 15th St.). Gainesville residents can meet Champion and other staff when USTA Florida hosts two community Meet & Greets on Jan. 17 at the Albert Ray Massey (Westside) Recreation Center, where residents can choose between a lunch time session from noon-1:30 p.m. or an evening session from 6-7:30 p.m. All residents are welcome to attend to enjoy refreshments and learn more about USTA Florida’s plans for the area tennis facilities, hear from City of Gainesville representatives and engage in a Q&A, and meet with USTA Florida executives and staff who will be supporting the facility and the community. The events are coordinated by USTA Florida in conjunction with the City of Gainesville Parks, Recreation & Cultural Affairs Department. For more details, visit www.playtennisgainesville.com. A junior competitive player born in Miami and raised in Palmetto Bay, Champion majored in Sport Management with a minor in Business Administration from Barry University. As an undergraduate student he completed four internships with the Miami Open tournament, and last year was accepted into the national USTA Player Development Mentoring Program. He has since spoken or coached at multiple Regional Educational Days, state and national conferences, and USTA Early Development Camps. In 2017 he was awarded as the USPTA Florida Division District Professional of the Year for the North Miami Beach/Aventura Area, and served as vice-president for the district. He is a USPTA-certified Elite Professional and a certified USTA High Performance Tennis Coach. 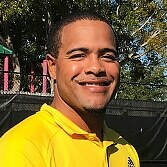 For 15 years he worked with the First Serve Miami National Junior Tennis & Learning (NJTL) after-school tennis and education program in a variety of roles, eventually serving as director of tennis where he managed two after-school sites and eight elementary in-school programs serving more than 500 children. In addition to the Jan. 17 Meet & Greets, local players will have another opportunity to meet the Gainesville staff on Feb. 2. The entire tennis and Gainesville area community is invited to grab their racquets or borrow one of ours for a Grand Re-Opening Festival from noon-3 p.m. at the Joyce Oransky Tennis Center at Albert Ray Massey (Westside) Park, featuring a free lunch, a tennis exhibition, face painting, prizes, caricaturist, tennis play opportunities for families, youth, adults and seniors. For additional information and to register to attend visit: www.playtennisgainesvillefestival.eventbrite.com. Gainesville is the third city with facilities overseen by the USTA Florida Tennis Management Division, which was established in 2017 to partner with municipalities to run quality tennis facilities. The agreement between the City of Gainesville and USTA Florida provides the not-for-profit with the opportunity to run tennis operations for the next five years, with the option for an additional five year period. The USTA Florida Board of Directors in 2017 unanimously approved the creation of a new Tennis Management Division to promote and develop tennis in Florida. USTA Florida Tennis Management delivers high-quality tennis programs, teaching pros and management, utilizing USTA networks and partnerships to ensure tennis grows in local communities for all ages and demographics. USTA Florida Tennis Management is raising the standards for tennis programming and facility management across the state of Florida. For more information go to www.ustaflorida.com/tennismanagement.